Meet York Daily Record/Sunday News editorial assistant Kim Curran in this Feb. 25, 2013, staff Q&A. Meet Natalie Schwind, York Daily Record/Sunday News editorial assistant, in this Feb. 18, 2013, staff Q&A. Find out what went on behind the scenes to make this issue happen. Meet niche publications and Smart magazine editor April Trotter. This June 26 post by Scott Fisher focuses on departing York Daily Record Editorial Board member Kara Eberle and new board member Samantha Dellinger. Looking for some ideas for your wedding or a baby shower? How about a gift basket or a craft to make with your kids? Smart magazine has you covered on Pinterest. 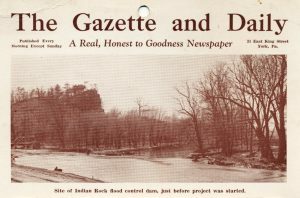 Read about the magazine’s plunge into this visual bulletin board that connected to York via co-founder Evan Sharp.